I don’t know why I don’t use toner regularly-maybe its because of my bad experiences with the stuff as a teen? I think that might be what happened. My skin got dried out so badly from things like Sea Breeze that I really just had to give toner up. Now I understand that I was just using the wrong one. This is a great pitstop on the way to using my favorite serums. 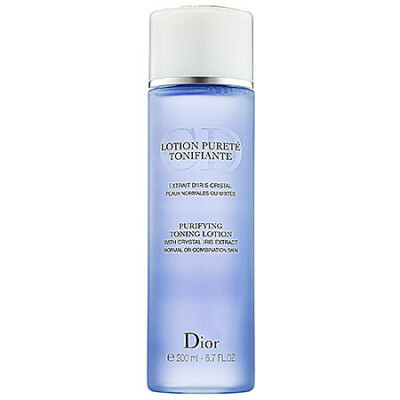 I feel like after using this toner my serums get smoothed into extra smooth and product free skin. The drawbacks for this toner are the price ($35/6.7 oz.) and the flowery scent in my opinion. I love the scent but boy it is fragrant! If you are not a fan of very noticeable scents in your skin care products you might want to give this a pass. It’s a clear toner but I love the beautiful blue tinted bottle. Dior knows how to package their products thats for sure. What it is: A toning lotion that purifies. What it is formulated to do: This lotion goes a step beyond cleansing to remove any remaining traces of impurities while balancing the skin for a fresh complexion that’s perfectly prepped for moisturizer. Suggested Usage: Morning and evening, apply with a cotton pad on face and neck after makeup removal or cleansing the skin. So I do love this but I’m looking for a replacement. I’ve been using this sparingly only in the evening so far. I don’t feel like I need it in the morning for the most part. I talked about this toner in this weeks Makeup Monday YouTube video and I got a lot of great toner suggestions from watchers with combination skin. Please feel free to comment below if you have any recommendations for me I really appreciate it! I got a sample of that too and yeah wowza! The price isn’t right! Save your $$$, use a dot of rose scented witch hazel. Also comes in lavender. Just a dot is not too much astringent. And not crippling on the cosmetics budget, you’ll have more bucks to spend on other purchases. Win:win. Yep, the Thayers Rose Petal Witch Hazel does beautifully, basic but quite good indeed. As a replacement, I would suggest the Mario Badescu Seaweed Lotion. It is an alcohol free toner. I have oily/combination skin and really like this. I recommend the Mario Badescu line very much. Great products.